One of the most important macronutrients for muscle building is protein. Proteins consist of amino acids, which are the main building blocks of your body. Most protein in your diet should come in the form of normal food, but you can also supplement it with various forms of powder supplements. Protein supplements are composed of dry protein powder that is derived from dairy (milk), eggs, soy and other things. Most well-known proteins are derived from milk. Cow milk is composed of carbohydrates, but also two main proteins: whey and casein. The percentage of casein in cow milk is 80% and of whey 20% (interestingly in human milk whey protein is the more prevalent protein). When the milk is coagulated, the two different proteins are divided out, with casein becoming a semi-solid clunky lump and whey a liquid. Whey protein is the by-product of turning milk into cheese. It used to be considered a waste in the process, but later the benefits of whey were discovered. It can be quickly absorbed in the body, which means that the body can break it down and use it quickly. Drinking whey protein causes an increase in the level of amino acids in the blood in about an hour after ingestion. This is very good for recovery after a workout, as it maximizes muscle synthesis and repair, and also decreases the breakdown of muscle. Whey is high in essential amino acids. It is especially high in leucine, which is an amino acid that is key to the activation of protein synthesis. Whey can also reduce stress, because it lowers cortisol levels. There are also several other beneficial properties of whey, some of which are being investigated for potential medical uses. The best types of whey protein for post-workout nutrition are either isolates or hydrolysates, however for other parts of the day concentrates are better (since they still contain other nutrients as well). Casein protein also comes from milk. It is a slowly absorbing protein and it can take the body several hours in order to absorb it. This is because it coagulates or forms a gel in the stomach, which then slowly releases amino acids into the blood stream (can do that for several hours). Casein also contains all the essential amino acids and one of its most beneficial properties is that it is high in glutamine. Glutamine is very important for protein synthesis and also for the release of the growth hormone. Another thing that casein does is that it also slows the process of protein breakdown (there needs to be a balance between protein synthesis and protein breakdown in order to ensure muscle growth). 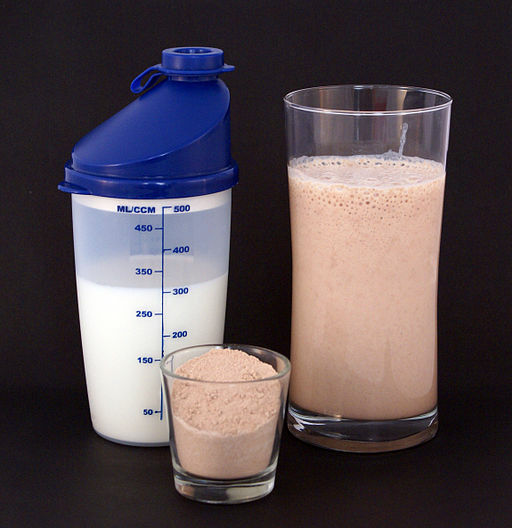 There is a bit of a controversy on whether to take whey and casein together or separately. Some people argue that they should be consumed separately, as casein might slow down the fast absorption of whey, however most scientific studies say that they can be consumed together, and that even when mixed they still keep their unique properties. For me, what I do is get a liquid whey protein right after my workout when I get home. I usually mix a whey isolate powder together with milk (I sometimes add things like bananas or berries for added carbs). While the powder is whey protein, the fact that it is mixed with milk, also adds some casein in there. This helps me get in some quickly absorbing protein in order to help me build muscle. At night, before going to sleep, on the other hand, I take a casein protein powder and mix it with milk and drink it. This way, when I am sleeping, the body gets a steady supply of amino acids throughout the night in order to help me build muscle. Great post, I think choose a protein that is highly soluble, meaning it dissolves well in liquids. Thanks for sharing.